Scrangie: Illamasqua Nail Varnish Competition - Win bottles of Illamasqua's contest shades! 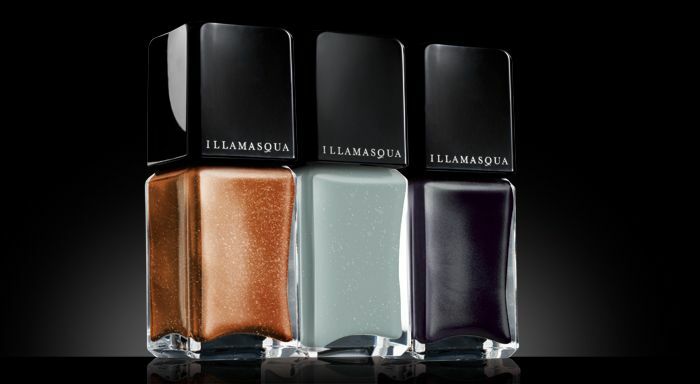 Illamasqua Nail Varnish Competition - Win bottles of Illamasqua's contest shades! Don't forget- tomorrow is the last day to enter! I want everyone who wants a chance to win to be able to enter before it ends! Illamasqua wants to give you a chance to win all three of their Contest winning shades! You know the ones- Eclipse, Shrapnel, Raindrops- the final three user-submitted creations chosen from over 6,000 entries? You can see swatches of them here and here if you're not familiar with them. Illamasqua is holding a competition (more of a give-away, really!) in October where you can enter to win all three Contest Winner polishes. All you need to do to 'compete' is answer an Illamasqua trivia question! Visit http://www.illamasqua.com/scrangie/ from now until October 16th 2010 (11:59pm GMT) and enter your name and email address and answer the trivia question to be entered into the giveaway. Illamasqua will choose a winner at random on October 20th 2010. Edit: This contest is open worldwide! International readers may enter! Edit number two! : Only one entry per person, please! Whoever wins the competition, I want to see your swatches! If you're the winner and a blogger, send me a link if you post them! Does it matter how many times you enter? Wow, thanks for posting this! :) I don't have any Illamasquas yet, Raindrops looks mesmerizing. I'd love to win because Illamsqua shipping prices to the States is pretty prohibitive. If they had free shipping (like Sephora, where if you spend fifty dollars shipping is free) I'd totally buy these new lacquers in a heartbeat. Oooh amazing. I'm a big fan of the colour that was inspired by raindrops. SO PRETTY! Ooh, thanks for posting this! I will definitely be posting swatches if I win. ooo! Yes...if i win, I will post swatches. I already know that Raindrops will be my favorite (the other two I was meh about) but the chance to win all three plus top/bottom coat is phenomenal! Meh I acidentially hit submit wihtout choosing a answer :( what to do? Wow that took me a tiny bit of time to research the answer, haha. I love nail polish but I'm not up to date on the nail polish collection world, I guess. I have just recently become a fan of your blog, so thank you for posting this! Awww. I just found out about how pretty is Raindrops today I really want this nail polish, I saw it over ChinaGlaze Recycle and love it. I know I'm way late in posting this, but I was lucky enough to win this contest! Thank you so much for sponsoring it! My nail polish arrived today and I am so looking forward to trying it. By way of an explanation for my lateness, between when I entered the contest and now my car died, I have a new car, it's registered, the whole house humidifier died, there's been some illness in the family....having these polishes arrive today has been about the best thing to happen in a whole month! I don't have a blog but my husband is an avid amateur photographer, so when I have a chance to try them out I can see if he wants to try to photograph them :). Thank you again, and again, I apologize for my lateness saying thank you.